Chrysler Corporation engineers have developed the ultimate Ram truck — a 500-hp V-10-powered tandem-axle, 6×6 concept pick-up that breaks new technological ground. The distinctive handling, traction and capacity capabilities of the T-Rex come from the unique six-wheel drive tandem axle design. Muscle for its outstanding performance and towing ability is a result of its modified high-output 8-liter Magnum V-10 engine, while a computer-controlled adaptive air-suspension system provides the superior occupant comfort. A stock V-10 engine was modified to boost power from 350 hp to 500 hp and torque from 450 foot pounds to 600. Modifications included high-compression pistons, billet crank, ported and polished heads, modified camshaft and tubular headers. 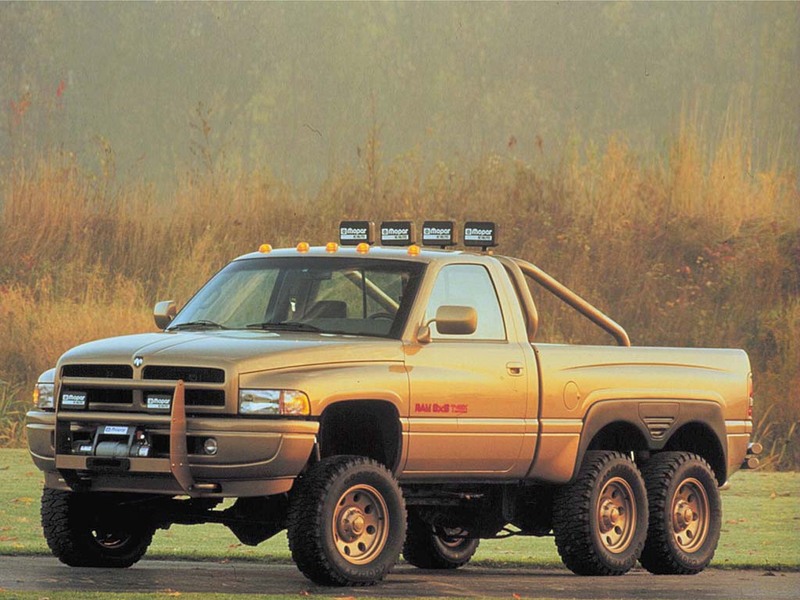 Transmission is the standard four-speed automatic for the Dodge Ram V-10 but strengthened to handle the increased load. The transfer cases are new and specifically designed to handle high torque.